Israeli forces on Wednesday shot dead two Palestinians during a predawn military raid in the Qalandia refugee camp near Ramallah, locals and medics said. Locals in the occupied West Bank refugee camp told Ma’an that hundreds of Israeli soldiers and dozens of military vehicles stormed the area around 1 a.m., entering the the densely-populated camp from all sides before ransacking homes and shops. During the raid, Israeli forces opened fire on 20-year-old Ahmad Jahajha from close range after he rammed his vehicle into a group of Israeli soldiers, witnesses told Ma’an. Israeli forces reportedly left Jahajha to “bleed to death” before taking his body and detaining another resident who had been shot and injured, witnesses said. Hikmat Hamdan, 29, a resident of the nearby city of al-Bireh, was also shot dead by Israeli forces after reportedly running his car into forces present inside the camp. Clashes reportedly broke out between armed men in the refugee camp and Israeli military forces before the forces left the camp around 4:30 a.m.
Four Palestinians were injured with live fire during the raid, one of whom was left in serious condition, according to Palestinian medical sources. The forces opened fire when a suspect “tried to ram his car into the forces,” killing the driver, the spokesperson said, adding that initial reports indicated that three soldiers were wounded by friendly fire during the incident. 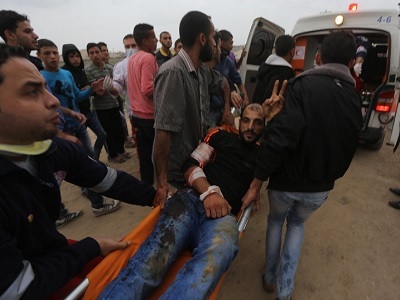 Witnesses living on the main road nearby the camp told Ma’an that they saw Israeli ambulances evacuating injured Israeli soldiers from the area. The army spokesperson said they were aware of a second attack in the camp involving border police officers that left another suspect dead. An Israeli border police spokesperson did not immediately respond for comment. The army spokesperson added that two “Hamas operatives” were detained during the raid. Local told Ma’an said Israeli forces detained 26-year-old Mahmoud Nayif Abu Latifa and Ismaiyin Nayif Abu Latifa after breaking into their homes. One of the two to be killed early Wednesday, 20-year-old Jahajha, was a sophomore at al-Asriyya College in Ramallah who studied media, according to Qalandiya residents. Jahajha and Hamdan are among at least 121 Palestinians to be killed since violence escalated in the occupied Palestinian territory on Oct. 1. The majority have been killed while carrying out attacks on Israeli military and civilians, while several have been shot dead during overnight raids by Israeli military forces. Forces killed two Palestinians in the Qalandiya refugee camp at dawn on Nov. 16 during a raid to demolish the home of an alleged Palestinian attacker. Laith Assad Manasra, 21, and Ahmad Abu al-Aish, 28, were shot when clashes broke out in the camp at the time. The forces demolished the home of Muhammad Abu Shahin during the raid, a suspect in the killing of an Israeli settler on June 19 near the settlement of Dolev northwest of Ramallah. Palestinian gunmen inside of the refugee camp — believed to be affiliated with Fatah’s Al-Aqsa Martyrs’ Brigades — had opened fire on Israeli forces at least two times the month prior, preventing Israeli forces from carrying out demolitions until them. Last week, camp residents staged a demonstration demanding that Israel deliver the body of 14-year-old Hadil Wajih Awwad.